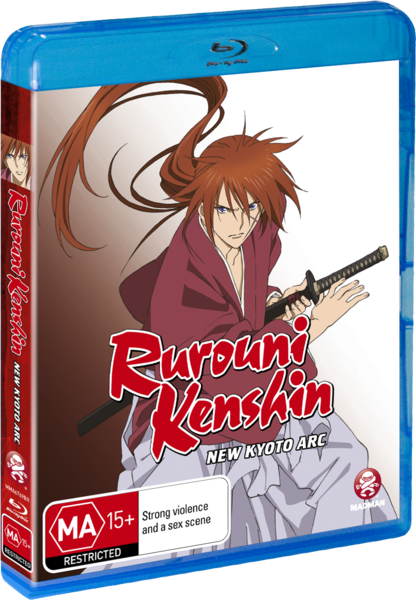 Rurouni Kenshin - New Kyoto Arc is a two part OVA (Original Video Animation) series that's also a remake of the "Kyoto Arc" from the manga and television series. This mini-series starts off with a female ninja named Misao who finds Kenshin and asks him to help her find someone she really cares for. Kenshin warns her that isn't a very good idea and will only lead her to disappointment but Misao convinces him to go anyway. We then cut to the bad guy of the show, Shishiro. Shishiro is a bandage-clad gang leader that looks a bit like an Egyptian mummy and his plan is to commit genocide and take over what's left of the land and rule like a God. Kenshin burst into Shishiro's hideout and demands that Shishiro surrender but Shishiro refuses and pretty much calls Kenshin soft for throwing away his murderous ways. 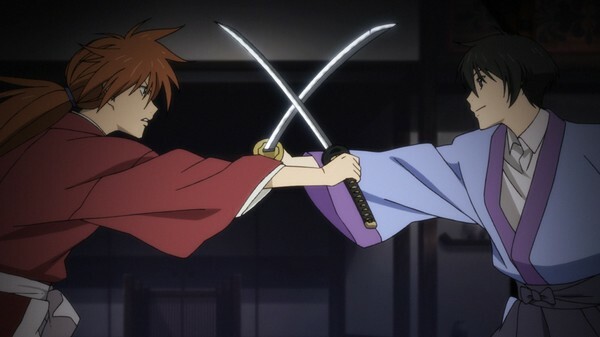 Shishiro starts admiring Kenshin's sword and leaves the battle with his second-in-command challenging Kenshin to a duel. The battle ends in a tie but leaves Kenshin in need of a new sword so he goes on a trip to visit a swordmaker so he can defeat Shishiro. Kenshin makes it to the Swordmaker's house but finds that the guy he is looking for has passed on and asks his son instead. The Swordmaker's Son refuses to make anything that can harm people in battle. Shishiro sends out one of his men to kidnap the Swordmaker's Grandson and wants a sword for the kids ransom. 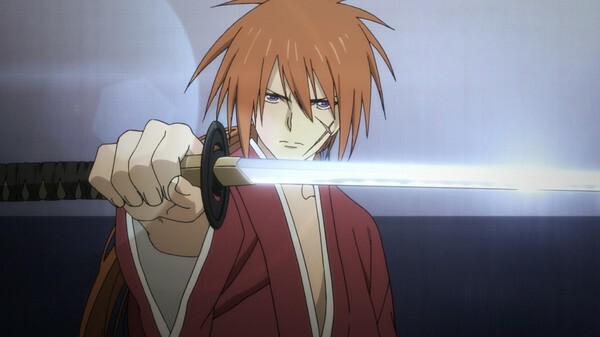 The goon only lasts a few seconds in a fight with Kenshin and the Swordmakers Son comes to his senses and gives Kenshin the last sword that his father made. Off to stop Shishiro. (Click "Read More" to read the full review). Growing up with watching this when it was known as Samurai X (yes kiddies, it had a different name back in the day) back from when it was on television on the Sci-Fi Channel (weird channel for it to air on) I was in pure joy when I heard that it was getting a fresh breath of life in the form of OVAs. Unfortunately it ended up being one of the most disappointing OVAs of all time. Main reasons why this was a disappointment was due to the story arc that these OVAs are based on and the pacing of the episodes. 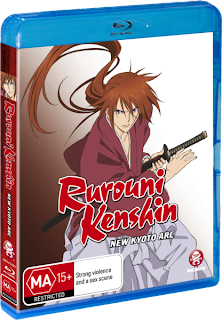 The story arc they chose is a good one but very hard to turn into a stand alone OVA series due to it being right in the middle of the manga and television series, by this point in the series you are expected to know who everyone is so it's not a good starting point for people who are looking forward to getting into Ruroni Kenshin. Pacing of these OVAs also make it quite difficult for long time fans to get into as well. The original version of this story arc takes up a whole season (thirty-four episodes) and what you get in these two OVAs is that whole season squeezed into two forty-five-minute episodes. This disrupts the flow and everything that was important that originally happened in this arc is toned down dramatically to the point where all the key scenes that were important in the original versions become very worthless and can't be taken seriously. There are some scenes that were changed for this version that wasn't in the original series and some of those scenes I liked but there were also some changes that will make all the long time fans scratch their head and say "That scene doesn't make sense now". The characters are pretty good and will bring nostalgic memories flow to your brains but that's not enough to save this piece of work. Artwork is really nice and clean looking with backgrounds that feel really grand and beautiful. The background sets also help add some much needed atmosphere and it does a pretty damn fine job at it too adding some really powerful vibes. Character designs are very warm and nostalgic looking and it's very great to see them again in glorious HD (high definition). I'm not going to lie the English dub is a little weird listening to it as I'm used to the old dub from the television series. Not to say that the English dub was bad as it was actually pretty decent but it does take some time getting used to. 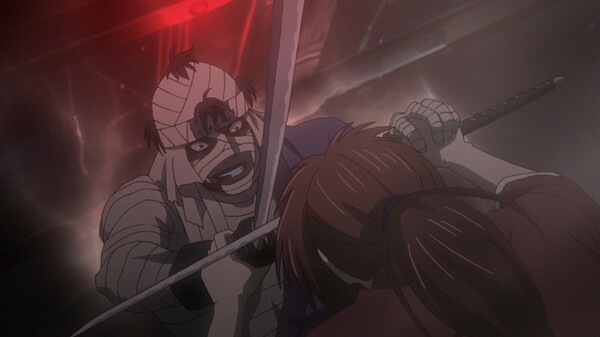 Overall this is not a good way to watch Rurouni Kenshin. It's too far into the story for people to get introduced to the series and it's squished down for long time fans of the series to enjoy. I hate to sound mean but this my friends is what we call a "dud". Avoid this and stick with the television series instead. Terrible remake of a classic animation.